Bull Shoals Lake isn't known for hybrid bass, but Mountain Home angler Frank Talbert Jr. may have landed a state record hybrid while fishing those waters. His catch may qualify as a world line class record as well. Talbert caught the 29- pound, 1-ounce hybrid Feb. 25 while fishing Bull Shoals Lake with Kurt Evans of Hardy. Evans, on his next cast, after Talbert hauled in his lunker, a 35-pound striped bass in nearly the identical spot, along with a good-sized drum. Ironically, said Arkansas Game and Fish Commission biologist Ken Shirley, the commission has never stocked hybrids on Bull Shoals. In addition, stripers are more common on Lake Norfork than Bull Shoals. Talbert's hybrid passes the previous state record by 2 pounds, 1 ounce. The previous record holder was a 20-pound hybrid caught on Lake Ouachita in 1989. It also may qualify for a world record based on the line Talbert used. 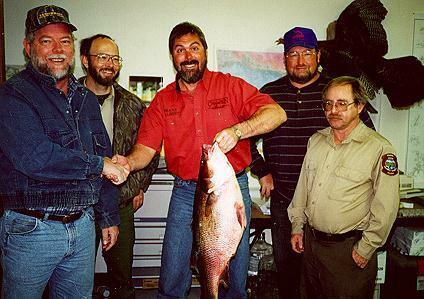 He caught the hybrid using a Rogue on 8-pound test line and the prior record was a 20-pound hybrid caught on 8-pound line in Illinois in 1993. The 42-year-old Talbert and Evans both members of Champion Boat's pro team were practicing for a tournament when he caught the huge hybrid. Talbert said they were fishing in the mid-lake area in a pocket where the wind was blowing dying shad toward shore. He was using a silver and black Rogue he was twitching slowly. After landing the lunker Talbert and Evans got hold of game warden Gary Wallace and fisheries biologist Stan Todd. They weighed the hybrid on certified scales at Harps Market. Shirley and fisheries biologist Mark Oliver certified the identification of the fish as a hybrid bass. A hybrid is a mix of white bass and striped bass with many similar appearances of both striped bass and white bass. A hybrid has horizontal stripes, often broken. The first horizontal stripe below the lateral line is distinct and complete to the tail. It has a deep body and seldom exceeds 12 pounds, although larger ones obviously can be found. Hybrids also have teeth in two parallel patches on the back of the tongue. Two theories were offered by G&FC personnel for how the hybrid wound up in Bull Shoals Lake. The most likely possibility was the fish came from a net-pen experiment conducted for hybrid bass at Pot Shoals in 1984. Some of the fish did escape, reported Shirley. G&FC personnel also speculated the hybrid could have come from Beaver Lake, passing through three dams' floodgates and following the White River into Bull Shoals. Talbert is the owner of Talbert's Music. He's lived here since 1986, although his grandparent's built a resort on Bull Shoals Lake in 1953.